Yesterday we posted a recipe round up for the home release of Disney’s Moana. As promised, we have come up with our own recipe for Disney’s most recent animated feature. 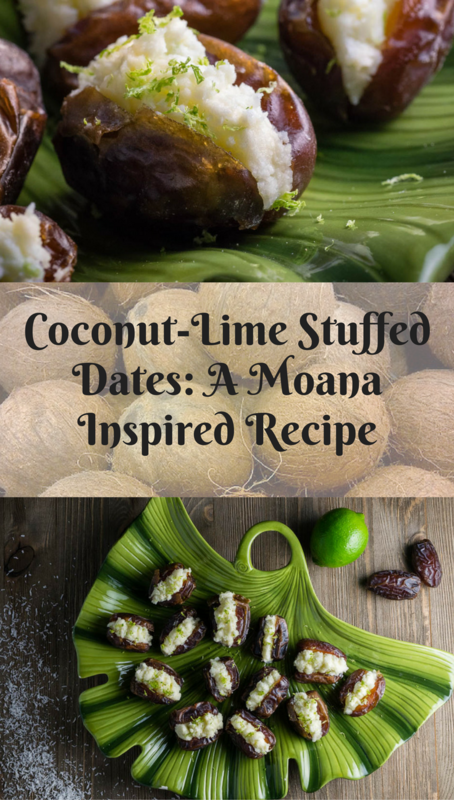 Our recipe for Coconut-Lime Stuffed Dates is a delicious appetizer perfect for enjoying while watching Moana. The heavy influence of coconut plays an important role in the early part of the movie. Our goal was to create a recipe that had a tropical essence but wasn’t inherently tropical. We also didn’t want to just throw together some tropical ingredients and call it a day. Therefore, coconut became the main focus. 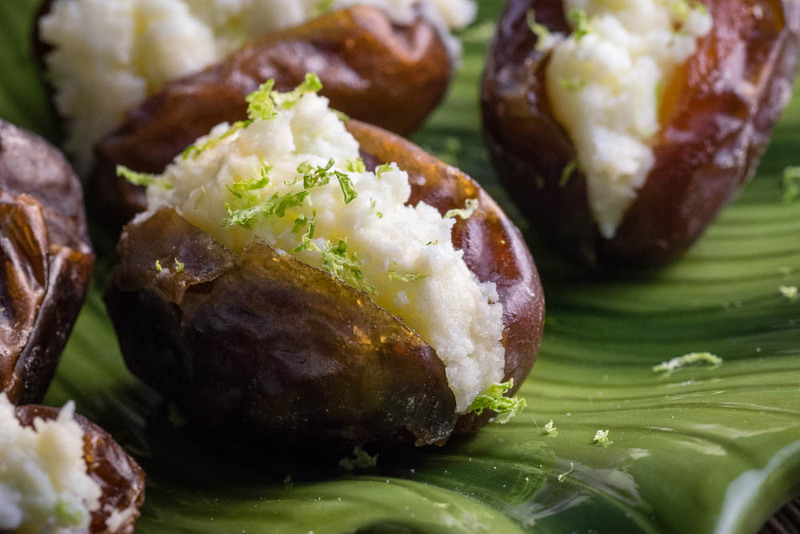 The use of mascarpone cheese and lime zest in the filling creates a flavor reminiscent of Key Lime Pie (which is one of our favorites). Once you start eating these babies you won’t want to stop. What is your favorite movie snack? Do you have a recipe for Moana? We’d love to hear about it! Leave a comment below or use the hashtag #GeekEats! Slice dates halfway and remove pit (leave bottom connected). Combine mascarpone, coconut, sugar, lime juice, and lime zest. Fill a piping bag or Ziploc with filling. Garnish with reserved lime zest. 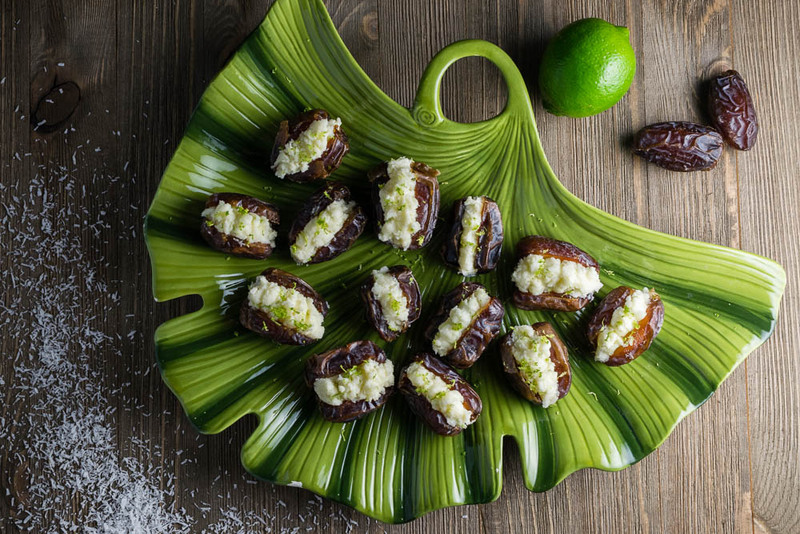 MY mouth is watering just looking at these fab treats, sweet dates with a taste of key lime pie. Yummy! OMG stuffed dates are my favorite! Never thought about stuffing them with coconut though…going to have to try this! I have always loved stuffed dates. These sound incredibly delicious…addicting, actually. Gotta try them! I love stuffed dates of all kind but have never had coconut. I need to try this! And I also need to see Moana! Oh, what intriguing little bites these are – my cheeks are tingling just thinking about the flavors. I can’t wait to watch Moana (finally) this weekend. These sound devine. I love all of these flavors. Next time I need an appetizer to bring somewhere, this might be the recipe I make.